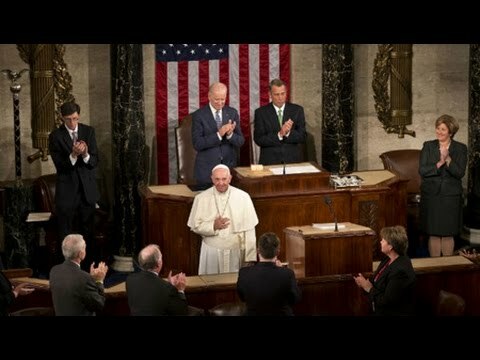 On Thursday, Pope Francis spoke to a joint session of the U.S. Congress. Here’s a little clip of some of what he had to say. POPE FRANCIS: Business is a noble vocation, directed to producing wealth and improving the world. It can be a fruitful source of prosperity for the area in which it operates, especially if it sees the creation of jobs as an essential part of its service to the common good. JAY: So the pope is saying business is a noble profession, especially if it creates jobs. This is somewhat short of what he apparently intended to say in the speech that was released by the Vatican ahead of time in print. There was a section there that he didn’t read. That section goes like this: “If politics must truly be at the service of the human person it follows that it cannot be a slave to the economy and finance.” That is a heck of a lot stronger than business is a noble profession. Go further in 2013, the pope in one of his major statements said, “While the earnings of a minority are growing exponentially, so too is the gap separating the majority from prosperity enjoyed by those happy few. This imbalance is the result of ideologies which defend the absolute autonomy of the marketplace and financial speculation.” A little further down he says, “A new tyranny is thus born, invisible and often virtual, but which unilaterally and relentlessly imposes its own laws and rules.” Strong words of condemnation of the current system. Well, now joining us to talk about the pope’s address in Congress, first of all, is Chris Williams. He is a professor at Pace University in New York City at the Department of Chemistry and Physical Science. He’s also the author of Ecology and Socialism: Socialist Solutions to Capitalist Ecological Crisis. Also joining us is Nancy Scheper-Hughes. She’s a chancellor and professor of medical anthropology at the University of California at Berkeley. She’s the author of several books, including Death Without Weeping: The Violence of Everyday Life in Brazil. She’s followed a lot of the work of the Catholic church in Latin America. In April 2015 she was invited to the Vatican plenerary session on human trafficking. CHRIS WILLIAMS: Thanks for having us. JAY: Chris, let me start with you first, and a little bit of the politics of this. I was really quite wondering why the heck did Speaker of the House Boehner invite the pope anyway? His rhetoric in terms of critiquing the excesses of capitalism is as strong as any European social democrat has delivered in a long time. And in Europe, perhaps not such radical language, although maybe these days even there. But in the U.S. Congress it’s pretty radical. Now, as I think I pointed out it was somewhat much more muted as delivered to Congress. But still, everyone knows what the pope’s been saying. But the pope called again for the abolishment of capital punishment. POPE FRANCIS: This conviction has led me from the beginning of my ministry to advocate at different levels for the global abolition of the death penalty. JAY: He was muted on the environment, but yesterday at the White House he was stronger. What the heck was in it for the Republicans to have, give him such a stage? WILLIAMS: That’s a good question. I mean, one-third of Congress is, are Catholic. And obviously it’s a big constituency in the United States, and it is the first time a pope has addressed joint house of Congress. So in many ways it’s an historic thing that they also want to show, despite the problems with differences with his stance on immigration, most notably, and the death penalty, that they can bring the pope in and have him speak to them. And they knew, I’m sure, that he would use the occasion to be more muted and wouldn’t make his criticisms of capitalism, comments on the environment, as pointed and direct as he did yesterday, and was much more diplomatic in most of his comments, to the extent that who knows why he left out the stronger language that you quoted earlier. JAY: Right. Nancy, we talk about his criticism of capitalism, but it’s not–he doesn’t propose an alternative to capitalism. He proposes an alternative, I guess, to the more rapacious type of capitalism. Where does that sit? Is this a radical departure in terms of church doctrine? Is he really the radical pope, or is this a pope that badly needs to kind of repair the reputation of the church, especially in Latin America, even in the United States, amongst poor Hispanics, that he needs to come out with a kind of social democratic type of language to sort of strengthen his own institution? SCHEPER-HUGHES: Well, I think that the language he’s used is very common in the past. It’s what we call vulture capitalism, or corporate capitalism, or global capitalism, which he very much sees as a great danger to poor people. But I think that he realizes you can’t say vulture capitalism to American Congress. They wouldn’t understand. Why he says business is an honorable profession is because he’s thinking about small businesses. People that run little shops or small rest houses, whatever. That’s the kind of business he’s talking about. He’s not talking about corporate finance, which he believes is a grievous mortal sin. But I’m sure he’s been told that Americans don’t understand this kind of–I mean, he’s called capitalism a por carilla. I don’t want to say–there’s many translations of por carilla. But one of the words begins with S and ends with T.
I mean, he has used very, very strong language in condemning the kind of capitalism that has created the rift between north and south, and has created, he believes, human trafficking and forced migrations of people. So he is very anti the kind of capitalism that the Republicans seem to be supportive, and I would say the Democrats, too. He’s a Latin American. He was not so radical, as you well know, when he was head of the Jesuits. When he was a young man he was very frightened of this language, of liberation theology, and of the revolutions that were being fermented in South America and in Central America. And he put a real damper on it. And you know, he not only had problems with some of his Jesuits, there were many, many poor people who were catechists of liberation theology who were dropped in the Rio Plata river. And I think he’s, in my writings and my understanding of him, is that he really is trying to make amends for his failures to understand that militant, military governments that were combined with very, very strong financial global capitalist interests was something that really divided the world and also had bad effects on the environment, our home, as he calls it. And he sees these as all related. It’s one large picture for him. JAY: But is it also–and I’m not trying to question his sincerity or not. But in terms of his defense of the institution of the Catholic Church, does the church not have to go in this direction if it doesn’t want to become marginalized in Latin America given the leftward tilt of where most people are headed? SCHEPER-HUGHES: Well, I don’t think Latin America is necessarily all leftward leaning at all. I mean, they’re–. JAY: I agree, of course it’s not. But amongst the ordinary people there’s certainly been a gravitation that way the last few years. SCHEPER-HUGHES: Well, among the ordinary people, many of whom are very poor and who are very smart, and have been trained in everything from [Paolo Freddi] to Foucault. I’ll tell you, I’ve met in my life more illiterate peasants and people living in shantytowns and favelas who are politically astute and they can talk about Gramsci, and talk about Frantz Fanon, and Paolo Freddi. And they are angry. And they want–their time has to come. And so their language is very, very strong. JAY: But that’s sort of my point, that the pope–again, I’m not going to question whether he believes it, let’s assume he does. But institutionally the church needs to talk like this to gain credibility in Latin America. SCHEPER-HUGHES: I don’t think that’s true, because I think that the church has also, for example, the majority of–many of the small parishes and churches are following more evangelical ways of reaching people. Pentecostal Catholicism is what I often see at the base. That is the idea to tap into emotions and to tap into individual change. And he’s talking a socialist language here. And I don’t think that’s the language necessarily of the masses in Latin America. I think that he’s developing his own path to a kind of democratic socialism, I guess it–but that’s, he’s beyond those kind of, he hates those sort of ideological descriptors of what he is. But you could win more Catholics in Latin America by speaking in tongues than you can by speaking of Marx today. JAY: Chris, when you look at the pope’s language on the environment you can kind of make two arguments, I think. One is for climate deniers, many of whom sit in the U.S. Congress, at least they purport to be deniers, and represent a whole section of American society that if it doesn’t outright deny it certainly doesn’t think climate change is an urgent problem. It seems his language seems to have opened up some space there in terms of the position he took, is taking. On the other hand he sits next to President Obama, who is, with some exceptions, with some small regulation has mostly been pushing or promoting various methods of financialization in order to supposedly deal with climate change. So how do you assess the effect of the pope’s words in terms of the debate that’s going on in the United States? WILLIAMS: I think it’s huge. I think it’s huge around the world. There are a billion Catholics, and now the pope has spoken, and this will be talked and debated and has to be taken up by the entirety of the Catholic church all over the planet. And that poses the greatest problem in the United States, of course, where he’s visiting. Where as you mentioned, most of Congress either don’t believe in climate change or don’t believe that it’s caused by us, both of which the pope has written about. Or maybe they do believe it, but they don’t really do anything meaningful about it, because the other thing about Congress is for the first time this Congress is a majority of millionaires. And so they are exactly the kind of rich people that the pope is condemning in his other writings. So I think that this is a huge opening for the left, environmentalists, for everybody to start a new conversation about, what is the pope saying? He’s saying that if we are going to get any kind of ecological justice change to protect the planet, we can only do so if we get social change at the same time. In other words, this is just as much about a question of social justice, moreso about social justice, than it really is about technological changes. And so that is a huge statement for somebody who sits as the representative of God on earth at the head of a multibillion-dollar organization otherwise known as the Catholic Church. JAY: What do you make of the critique of exactly that, that this is a multibillion-dollar corporation. As far as I know and people we’ve talked to they’ve not made, for example, any divestments in fossil fuel, and that it’s a very–again, it’s a way to kind of make the institution look modern and relevant, but if he doesn’t call for more specific kinds of measures, like for example, I don’t know. Maybe he has and I’m not aware of, you can tell me. Specific, for example, regulation versus financialization as a method. Like, instead of cap and trade, serious regulation. If he doesn’t get into the weeds on some of that stuff does it actually just create room for kind of neoliberal ways of dealing with climate change, which most people think aren’t going to be very effective? WILLIAMS: No, they’re certainly not, and they’re likely to make things much worse. Actually, he has said some things about that. He has called cap and trade unsuccessful, and the wrong way to go about bringing about emissions reductions, which is what we are supposed to be doing and is so urgently necessary. So the fact that he’s called it urgently necessary, he said that the market, the deified market, in the language that he used, untrammeled free market capitalism is a pile of dung. Is another significant feature of the encyclical that he wrote, and of its comments. So the idea of financialization and neoliberal market solutions to the environment is something that he is against. But to what extent the kind of structural imbalances and injustices are really going to be tackled through a moral framework is questionable, because it’s not just a question of morals, it’s also a question of politics. And clearly if we actually did make meaningful change with regard to climate change, with regard to the refugee crisis, with regard to racism, ending the death penalty, how are those things going to actually happen? And I think that’s what’s significant. The fact that he mentioned Dorothy Day, who was a socialist member of the IWW, and who also had an abortion, is significant in terms of it’s really through struggles like she engaged with, and through struggles that Martin Luther King, obviously, engaged with, that we’re going to make progress. And it’s only through those kind of social struggles. So is the pope open to that kind of level, where the masses take to the streets and we self-organize for the kind of change that we need? I think that’s really the only solution. But I think that would be asking a little bit much of the pope. But I would stress that it’s also very much a political question, because we’re not all going to gain from a kinder, more equal society. The people at the top are going to be losing out, and many of them are in Congress. JAY: Nancy, how–the stronger language of the pope, both in terms of his critique of capitalism, on the environment and some of the other issues, how much is this making it down to local churches in the United States, and then say in Latin America? SCHEPER-HUGHES: Well, I think that the church is a very divided church, and I know that within the Holy See and in the Vatican, as well as in Latin America there’s a lot of grumpiness about what is this pope going to say next? What is he going to do? So I think that a lot of what he’s doing right now, even in tempering his language, as he did I think with the abortion Jubilee, you know, forgiveness for all the women who wish to confess that they had an abortion, to feminists is like oh, gosh, this is a double bind. Okay, I mean, we have to admit that this was a mortal sin, and then we’ve got to give confession. And then for one year, we could be brought back into communion with the church. I think that he was doing this to prepare the old cardinals and the bishops, and to say that, you know, we’ll have more to say about this. And I also, I was going to make the point that Dorothy Day was a muted example of a woman who was a communist, for a while, who had a child outside of marriage, who had an abortion, who got married and left her husband. And she became, gave her life to social justice, essentially, in the Lower East Side. She produced the Catholic Worker, which had a hammer and a sickle on it. My mom and dad, who were immigrants, my grandma, grandpa, and whatever, were very, very Catholic. But we always had at our dinner table that one cent copy of the Catholic Worker. So the fact that he brought her up, even though as she became older her work was again, somewhat more modified. She became a pacifist and was arrested many times. But I could not believe what I heard. I was a Catholic Worker for several years, and got to meet her once or twice in the Lower East Side, but helped found the Berkeley Catholic Worker. And on her principle, it was a shock to me that Dorothy Day’s name was listed among the four great Americans that he wanted to honor. JAY: In the same paragraph with Abraham Lincoln. SCHEPER-HUGHES: Yes, right. And Martin Luther King, and Thomas Merton. You know, that wasn’t such a surprise given the powerful role that Thomas Merton had in bridging religions and in introducing Zen Buddhism, both Chinese and Japanese Zen Buddhism to Americans. So each of the persons that he chose follows one of his paths. And he always says, pray for me, right. And then he added, with a little smile on his face, and he said, and those of you who can’t pray, don’t pray or don’t believe, please send me your good wishes. So he really is trying to create this very, very open theology that is beyond theology. That is, he loves talking to atheists, to secularists, to whatever. He wants to know, he wants to get close to people. He wants to understand them on the ground. He ‘s kind of an existentialist, I would say. JAY: All right, we’re going to have to wrap it up. Thanks very much, Chris. Thank you, Nancy. JAY: Thank you very much for joining us on the Real News Network.